The 2014 Goldring Travel Food & Wine Tasting aboard the AmaWaterways AmaCerto was a huge success. 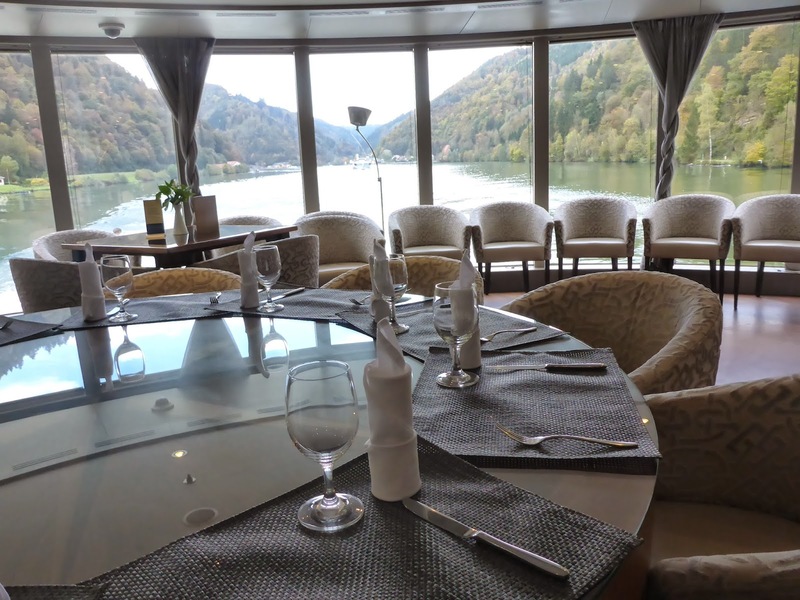 With an absolutely gorgeous setting in the aft lounge/Chef’s Table as we sailed the Danube River we had a true taste of the wines of Germany, Austria, Hungary and even the AmaCerto…plus one from Romania (which the staff included quite proudly). five countries and 15 wines..plus all the food! But the star of the event wasn’t only the wine, but the food. While I had picked up some great cured meats, liverwurst, cheeses and such in Wurzburg (and we also picked up some “stinky” cheese and truffled gouda in Passau, Germany), Robert, the AmaCerto chef did a spectacular job not only combining what I found with some of the smaller menu items on the AmaCerto, but some very creative items including his homemade goose liver pate with marmalade and more. I have always said that chefs on cruise ships got their jobs because they are actually chefs…not cooks. So if you give them the opportunity to “do their thing” something spectacular will come of it...and that it did. had one heck of a view from the AmaCerto! Because of the wide variety of wines I decided to do things a bit out of the norm. We started with two sweeter wines: a Selbach Riesling Spatlese and a Bacchus Spatlese (from that strange winemaker in the Franconia region of Bavaria). From there we enjoyed two Gruner Vetliners and another four whites, followed by five reds including Zweigelt and Hungarian Cabernet Sauvignon, among others, as well as German rose (Spatburgundter Weissherbst) and finishing with a Georg Breuer 2011 Schlossberg Riesling. A touching moment was when the Romanian assistant introduced a "surprise": A Romanian wine! The staff onboard the AmaCerto are proud of what they do and are so very happy doing it...and it makes the food and the wine taste even better!